After eating sweet potato fries in restaurants numerous times, I decided it was time to try my hand at making them. However, I was determined not to bake them. That’s cheating. I wanted real, restaurant-quality fried sweet potato fries. So I bought a tub of palm shortening (because #Paleo), burned myself several times, and ultimately ended up with these delicious, bacon-y, salty sweet potato fries. The secret is to fry them twice for optimum crispiness. Full disclosure: this was the first time I ever deep fried anything in my life and it’s a little harder than you’d imagine. Just get yourself a cooking thermometer and don’t be too hurt if you add another burn scar to your cooking wound collection. Think of it as a symbol of a job well-done. Chop ends off of sweet potato, and then chop sweet potato in half horizontally. This will make the sweet potato easier to manipulate while chopping. 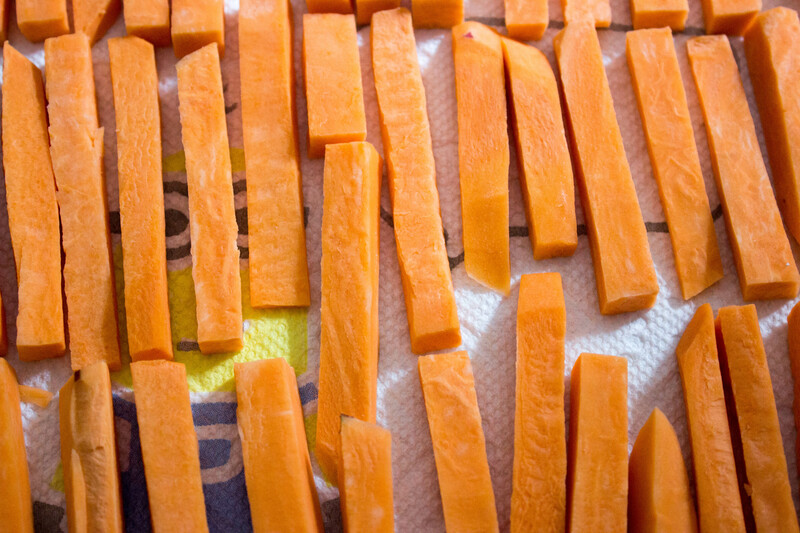 Slice your sweet potato halves vertically this time, doing your best to make each slice about 1⁄2 inch wide. Next cut vertically again, about 1⁄2 inch wide so slices look like fries. Continue chopping in this way until you’ve sliced all of your sweet potatoes. Place cut fries in a large bowl. Fill bowl with ice cold water and ice cubes. Set bowl in the refrigerator for 30 minutes to 1 hour. This process removes starch from the fries so they can get crispy. While fries are in the refrigerator, add all aioli ingredients except olive oil to your food processor. 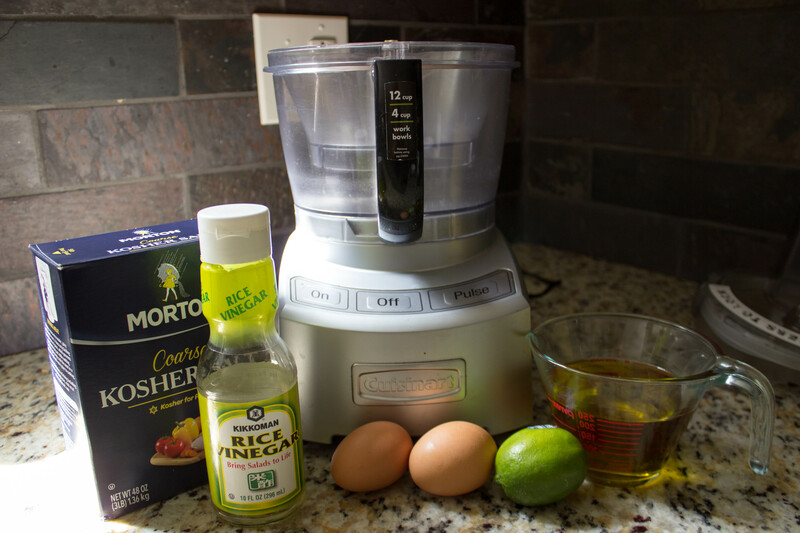 Once ingredients are combined, turn food processor on and slowly add olive oil in a thin stream until all used. After fries have chilled for 30 minutes to 1 hour, remove to a baking sheet lined with paper towels to absorb water. Pat fries with a towel to get them as dry as possible. Add container of palm shortening to a medium sauce or sauté pan on high heat. Using a thermometer, bring the temperature of the shortening up to 350 degrees. If you overshoot this temperature, it is okay because it will go back down once the fries are added. Once shortening is at your desired temperature, add a small batch of fries. Let fries cook in oil for 3-4 minutes. In the meantime, prepare another baking sheet with paper towels to absorb the grease. Once fries have been in oil for 3-4 minutes, remove to the baking sheet. Repeat this process until all fries have made it into the oil and onto the baking sheet. While fries are cooling, add bacon to oil. Fry bacon for approximately 2 minutes, or until cooked fully. Keep an eye on the bacon, as it can cook faster depending on the thickness. Remove cooked bacon to another plate lined with paper towels to absorb the grease. Raise temperature of shortening to 375-400 degrees. Add fries again in small batches, frying for an additional 3-4 minutes, or until golden brown. Repeat again until all fries have been fried twice and removed to the baking sheet. Chop crispy fried bacon as small as possible, ideally to the same size as your salt. In a large bowl, add cooked fries, chopped bacon, and salt. 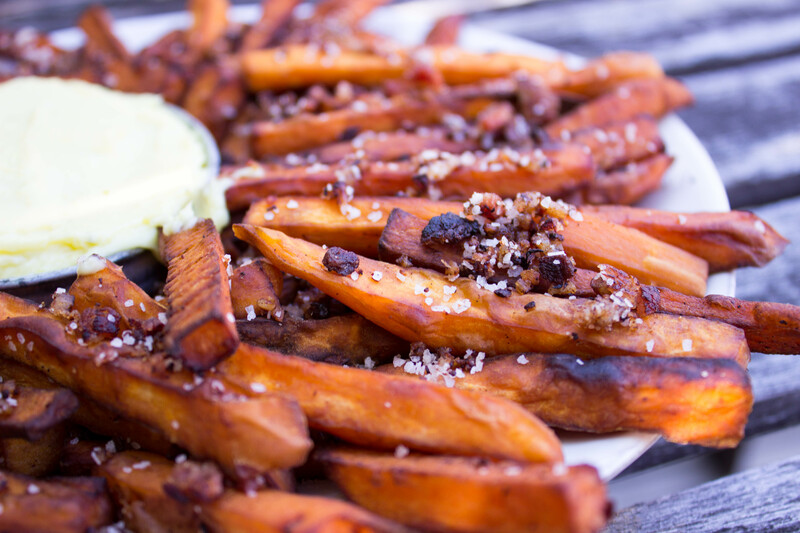 Toss until seasoning is distributed over fries. Remove to a plate and serve with aioli. ouch! and you didn’t give up . . . that’s my granddaughter!